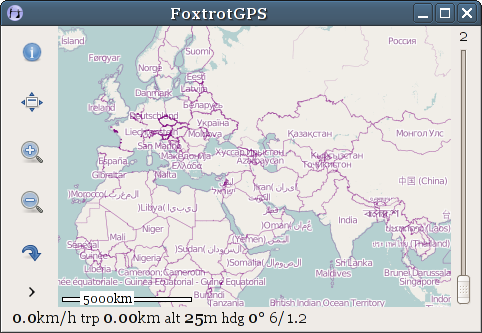 FoxtrotGPS is an easy to use, free & open-source GPS/GIS application that works well on small screens, and is especially suited to touch input. It spun off of tangoGPS in 2010 with a focus on cooperation and fostering community innovation. FoxtrotGPS is freely available to the public for use, redistribution, and modification under the terms of the GNU General Public License 2.0 (GPLv2). Version 1.2.1 is available for download. FoxtrotGPS has a commitment to extending support for open standards and open architecture, and to helping grow the developer community through those improvements. Users and developers are invited to connect and collaborate with us and with each other via the foss-gps e-mail list provided by OSGeo, as well as on the #FoxtrotGPS IRC channel on the freenode network. If you've found a bug, please see our bug-tracker. For help building FoxtrotGPS from a fresh bzr branch, please refer to the build instructions. Please also see the FAQ.